This projectile point was discovered during the excavation of the Mesa site in northern Alaska above the Arctic Circle. Of the 154 complete and fragmentary points that were found this is one of the best examples. It appears that it may never have been resharpened. Mesa site points are "lanceolate in outline, with parallel flakes perpendicular to the long axes of the point, which results in a ridge down the centerline of the point, creating a lenticular to diamond-shaped cross-section. (Kunz, 2003: 28)" They most closely resemble Agate Basin points. This point is made of a very slightly translucent grayish/green chert and it measures 7 7/16 inches (6.2 cm) long. The Mesa site was discovered in 1978 by Bureau of Land Management archaeologist Michael Kunz in the northern foothills of Alaska's Brooks Range above the Arctic Circle. The site was tested in 1979 and 1980. Full scale summer excavations began in 1991 and continued through 1999. Several years of excavations eventually produced 51 carbon dates that range from 11,700 to 9,700 years before present. The best estimated core record of time for the Paleo feature of this site seems to be somewhere between 10,400 and 9,800 years ago. The Mesa site is recognized as the first well-documented Paleo-Indian site to be found in the North American Arctic. The Mesa site is located on a high plateau approximately 200 feet above the rolling Arctic tundra. It was periodically used as a hunting lookout that provided a 360 degree view of the treeless plains below for more than 60 square miles. These early people were hunting big game animals such as caribou, musk oxen, extinct bison and mammoths. This lookout provided them with a convenient way to locate animals in the area. The Mesa site produced a classic Early-Paleo stone tool assemblage. Leading North American Paleo-Indian archaeologists Dr. George Frison, Dr. C. Vance Haynes and Dr. Dennis Stanford have visited the site and studied the artifacts and have concluded that the Mesa tool assemblage is typically Paleo-Indian. Also, other archaeologists have studied the tool assemblage and have reach the same conclusion. This site produced gravers of a type that have been found in Clovis tool assemblages from coast to coast in the United States. End-scrapers with and without spurs were also found. End-scrapers or so-called thumbnail scrapers are found in tool kits on the majority of very early Stone Age sites in North America. The more than one hundred projectile points that were found on the Mesa site are very similar to Agate Basin points, although they seem to average slightly smaller. This may be a factor directly caused by chert availability in the area. These projectile points were most probably hafted on spears and thrown with an atlatl or throwing stick. They may have even been hafted onto short fore shafts that could have quickly and easily replaced a broken point on a larger spear shaft. The "Mesa points" are lanceolate in outline and have heavily ground or smoothed basal edges where they were hafted to a spear. These points were resharpened and repointed uniformly by pressure flaking without beveling like some later types of spear points. Only two later period features were found on the Mesa site. 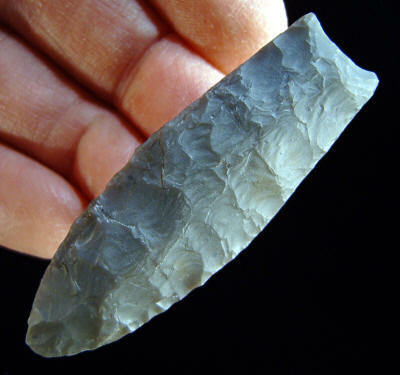 One is in locality A where a late northern Archaic micro-blade feature was found that dates to approximately 3500 years ago. Most of the artifacts found there were in the form of 120 micro-blades. Another item, a 45-70 cartridge, was also found on the Mesa site. This fairly recent artifact probably indicates that sometime between 1885-1910, an Eskimo, had climbed to the site and fired at an animal on the Arctic tundra below. The Mesa site was an important discovery. It has contributed new theories and insights into how these early people lived and were colonizing the New World.